HURRY! Commit to your 2019 Sustaining Partner sponsorship before it's too late! do what we do without your support! Our 2019 selections will provide you with many great opportunities for you to showcase your organization to our membership. Make your selections TODAY! A sincere thank you to the following companies who have generously supported CAI Austin in 2019! Our Sustaining Partners are dedicated to supporting our Chapter. Click on their logo and a hyperlink will take you to their web site. Please visit their business establishments and support them in return. Without the support of our gracious business partners, we could not do what we do. All four Texas chapters (Austin, Dallas/Ft. Worth, Houston and San Antonio) recognize that our business partners play a pivotal role in the health of each of our chapters, and exhibit the spirit of Texas. Thus, we recognize these business partners who have memberships in all four Lone Star Chapters with this heart-shaped Texas logo. 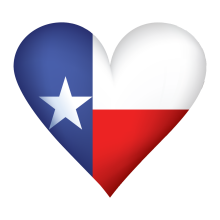 Our ‘Deep in the Heart of Texas’ business partners will be recognized in magazines, directories, signage and on chapter websites by this special logo in recognition of our chapter’s appreciation.